How Do I Configure Eventbrite Integration? The Virtuous integration with Eventbrite allows users to create events in Virtuous and then sync them to an active Eventbrite account. Users can then use the public URL for the event in Eventbrite in emails and mailings and track responses via Eventbrite. Those responses will then be synced to Virtuous; any Individuals already existing in Virtuous will be added to the Event list, and users will have the option to create new Contacts via the Gift and Contact Import screen for any new Individuals. Note: For any events where a fee is charged to attend, the transaction data will not be synced to Virtuous. Users will need to export data and then import those transactions as gifts. For more on this, check out our Gift Processing video series. 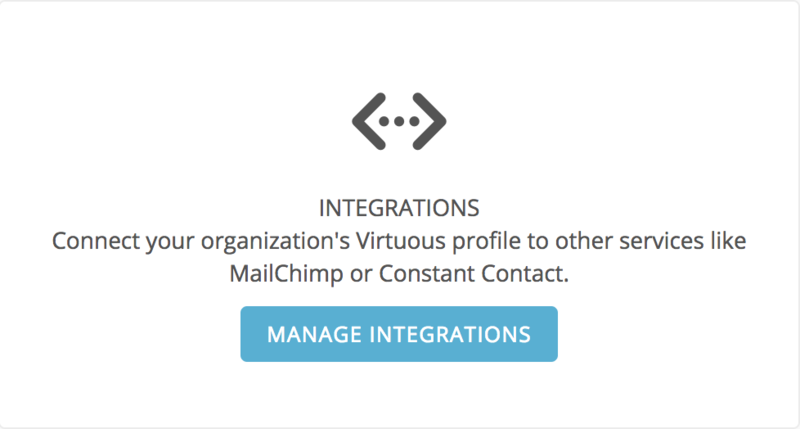 Log in to Virtuous and click on the bottom icon in the menu to go to the Configuration page. There, select the Connectivity tab and then click on Manage Integrations. Look for the blue "Add an Integration" button, click to bring up the New Integration dialog box and then select "Eventbrite Integration" as the Integration Type. 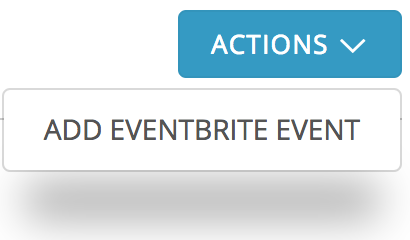 Click "Save" and you should see Eventbrite listed on the Integration page. Look for the blue "Grant Access" button to the right and click on it to open your Eventbrite account, where you'll be prompted to log in and grant access to Virtuous. Data moved between Virtuous and Eventbrite in a defined pattern, which must always start in Virtuous. An event that already exists in Eventbrite cannot be synced on Virtuous. Select the Events screen from the left-side menu and then create a new Event. 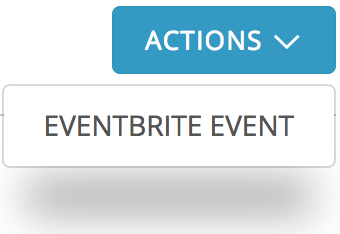 Once the Event has been created and saved, on the Event screen, look for the "Actions" button in the upper-right, click, and then select "Add Eventbrite Event." This will open Eventbrite and create the new Event there. You will be taken to the Event page in Eventbrite, where you can make any further customizations, and then access the public URL to use in communications for tracking registrations. Note: In order to sync to Virtuous, Events must have a valid address and the Event Date MUST be in the future. Once an Event has been synced to Eventbrite, you may access the page at any time from the Virtuous Event by click on Actions and selecting "Eventbrite Event." In order to accurately capture data from Eventbrite registrations, users will need to set up their Eventbrite Order Form to collect relevant data from registrants. In order to see Address data in Virtuous, the Order Form must specifically request Home Address; no other Address data will be synced to Virtuous. For more on configuring the Order Form, check out Eventbrite's help pages.